Despite less than a perfect weather forecast, this past Saturday turned out to be a near perfect day for a run through the woods of Northern Virginia. I've posted my report here. What a great time we live in to be an ultrarunner. So many events within easy driving distance every weekend of the month can make it difficult to choose. However, I had made up my mind a year in advance that I would return to challenge the rolling hills of the Bull Run Run. This would be the 15th year of the race that was the reason for the beginning of the Virginia Happy Trails Running Club. My only previous appearance was in 2005 and I ran 12:15 as I struggled for much of the 2nd half. This year I was hoping for a much stronger performance as I continue to build my fitness for a strong summer. Friday afternoon was cool and beautiful as I arrived for packet pick-up at Hemlock Overlook. It was great to see so many of my VHTRC friends while hanging around waiting for the race-briefing. We had a delicious meal catered by Carabba's and then I settled into the bunkhouse to get some rest. Fred would be along soon and before long it was lights out. Saturday morning was near perfect with the temperature in the low 40's as we prepared for the start. Everyone was hoping we could get most of the run over with before the predicted rain would start. We started promptly at 6:15, just as it became light enough to see without having to carry a light. Fred and I planned to run together for as long as our paces fit and we started off easily in the middle of the pack for the short loop around the grounds of the park facility. Soon we were on the single-track and heading downhill to the riverside . I was feeling fine and enjoying the morning, the trail and the company. The Bluebells were in their full glory as we reached the bottomlands in the river's flood plain. I was noticing how Spring seemed to be running about two weeks behind us in NC. The redbuds that were so pretty during Umstead have all turned to green now but are just opening their buds here in Northern Virginia as well as the dogwoods. Even better was the lack of mud this year. Despite some rain earlier in the week the trail was in very good shape. There were some muddy areas but not bad and it was not much of a problem all day. I was glad to reach the first aid station at Centerville Road and the 7.2 mile mark. Since it was a cool day I was running light without a bottle and I was getting thirsty and ready for some calories. I took about two minutes but Fred was in and out so I lost contact with him. The next 2.2 miles to the turnaround are completely flat after coming down from the bluffs. This area can really be a mud-fest but was in really good shape this year. It also gives you a chance to see all the runners in front and behind for the first time. I was running well but didn't catch up with Fred until just as I arrived back at the aid station. After quickly downing some gatorade and M&M's, I caught back up to Fred and we ran again together all the way back to Hemlock Overlook and the 16.6 mile mark. Once again Fred was out quicker than me and for the rest of the day we would play leap frog. Fred had just run the 100 at Umstead and his energy would come and go and I was taking more time in the aid stations. I continue to feel pretty good and was happy with my times so far as I passed through the checkpoints. 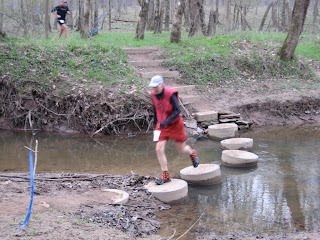 I was quickly out of the marina at 21 miles but to me the next section is one of the most difficult of the course. Unlike the mountain ultra's in Virginia, there are no really long climbs but the ones here are relentless. Up and down, up and down. It is very difficult to get into a rhythm and some of them are very steep. Slowly but steadily they began to wear you down. As I was approaching Wolf Run Shoals, I was feeling their effect and I wasn't feeling too good. I've done enough of these to know I usually hit a bad stretch so I wasn't worried too much. A quick hug from Kirsten and I was quickly on my way to Fountainhead. That next section is only 2 miles and not too difficult but my condition continued to worsen. I immediately sat down for a couple of minutes on a picnic table and Fred came in right behind me. He grabbed a slice of pizza and was on his way. I didn't feel like eating but a few chips and drank some coke and headed out on my way to the Do Loop. I felt better for the next couple of miles and caught up to Fred once again but by the time I got to the Do Loop aid station I was feeling worse than ever. Janet Vincent gave me a hug and asked what I needed. I told her I didn't know but I needed to sit down and get things under control. She proceeded to wait on me bringing me everything I asked for. Tom Corris and Lou Jones kept checking on me to make sure I was alright and then kindly suggested I get up and get going. After about 6 minutes, a rolaids, an e-cap, some coke and some grilled cheese sandwich, I thanked them and headed out. It had been sprinkling rain off and on since about 11:30 and as I started into the Do Loop it began to rain a little harder. I put my vest on but I started sweating so I took it off and the rain stopped again. Amazingly, as I ran the loop I began to feel much better and I came back into the aid station looking like a different man than I had 45 minutes earlier. Janet and Tom both commented how much better I looked and I told them I had just needed a little Do Loop Love to get me going. I wasted no time and just grabbed a cup of Mt Dew and was on my way . For the rest of the day I just got stronger and stronger with each aid station I passed. I had been steadily passed since around 18 miles but now late in the race I was catching back up to most of the group of runners I had been around earlier. My goal had been to run under 10:30 and as I came into the Marina with just 5 miles to go, I felt I had at least a shot at it. I ate my only gel of the day, washed it down with coke and took off on a mission. Before long I caught up to Fred. I was hoping to run with him a little but his legs were dead from Umstead and I was quickly out of sight. I was running great and passed quite a few people in those last miles but the rocks along the river slowed me quite a bit. A quick glance at my watch and I knew I wouldn't break 10:30 but considering the way I felt earlier I was very happy to be close. A strong, smiling run across the finish line and my race was done. This is a fantastic race, all trail in a beautiful area. The VHTRC folks put on a 1st Class Event with experienced and helpful volunteers. Bob Phillips stepped up this year to take on the Race Director position and I think everyone will agree that he did a great job. On to the next one.